VATICAN CITY (CNS): The Catholic Church, in a series of recent studies and pronouncements, has recognised that Christians shared in responsibility for anti-Semitism and the attitudes that led to the Holocaust, a leading Vatican official said. Now these reconciliatory gestures from the hierarchy need to be translated into the attitudes and actions of average Catholics, said Cardinal Walter Kasper, who is president of the Vatican’s Commission for Religious Relations with the Jews. Cardinal Kasper made the comments in an article published on September 7 by the Vatican newspaper, L’Osservatore Romano, to mark the fourth European Day of Jewish Culture. 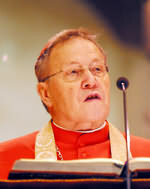 Cardinal Kasper said the issue of anti-Semitism was linked to the question of how Christians viewed their own relationship to Jews as the “chosen people” of the Bible. He said it is clear from Scripture that God did not abandon his alliance with the Jewish people and that the Church did not “replace” Israel in the divine plan. The Jews were not repudiated by God at the time of Christ’s life and death – but, unfortunately, this notion was widespread among Christians for many centuries, he said. Cardinal Kasper said a 1997 Vatican symposium laid much of the groundwork for the most recent clarification of the Church’s teaching.